Project Justice transitionnelle: l'expérience Marocaine plans to share those extremely important Moroccan experiences about transitional justice and community reparation on Remix the Commons platform. Alternatives Forum in Morocco(FMAS) and Portail E-joussour take in charge of this project, which both based in Rabat, Morroco. Project Justice transitionnelle: l'expérience Marocaine aims to share videos about this process of transitional justice and community reparation. For Morocco, the Community Reparation Project is a huge project contributed to transitional justice. A total sum of 159 million Dirhams was mobilized and total number of completed projects was 149. These videos talked about how to preserve memory of victim communities during “the years of lead” in Morocco and what kinds of public hearings took place, in fact those hearings gave the highlight of an extensive process of citizen deliberation, compassion and free expression in Morocco. They also talked about lots of stories about how community reparation project aimed to improve the living conditions of the people in victim communities and empower them. In fact, those materials mainly focused on women and children. Project Justice transitionnelle: l'expérience Marocaine believes Moroccan experiences in transitional justice as commons are useful and valuable to other countries, especially to Arabic countries have the similar history of transitional justice, such as Iraq, Egypt, Tunisia, Syria, Lebanon, Palestine, Algeria and so on. In the next step, Project Justice transitionnelle: l'expérience Marocaine will keep on sharing more historical videos and materials about experiences in transitional justice, such as the videos of public hearings, the videos of public seminars and conferences, historical pictures and final reports of the community reparation project. As open resources, these documentaries, videos and reports are free to use for the public goods. Documentaries: Community Reparation Program in Morocco is a compilation box, which contains fifteen CDs and DVDs that show a reparation modality that the Equity and Reconciliation Commission (IER) implemented part of community reparation, published by the Moroccan National Human Rights Council(CNDH), In January 2013. These 15 CDS and DVDS include abundant and useful historical archives of community reparation in Morocco : documentaries, reports, news articles and photos. Most of documentris, articals and reports are in French or Arabic. Videos: Public Hearings is a compilation box, which contains fifteen DVDs of public hearings which were organized by the Equity and Reconciliation Commission (IER), published by Conseil Consultatif Des Driots de I'HOMME(CCDH). Those public hearings took place in several cities, such as Figuige, Khenifra, El-houssaim, Marrakech, Rabat, El Rachidia. In them, the victims of years of lead were called to testify freely about their suffering, without naming their torturers. For the organizers of the hearings, it is not to "judge" but to "establish the truth" and "reconcile". 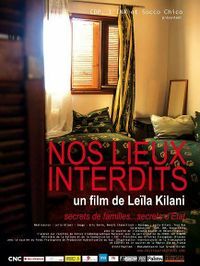 This documantary(English name:Our Forbidden Places) is a work of Moroccan female director Leila Kilani, released in 30 September 2009 (France). During the oppressive reign of Moroccan King Hassan II in the 70's and 80's (a.k.a. Years of Lead) many dissidents went missing. After the throning of a new king, a truth commission was formed in the 2000's. Families of the missing speak. In 2004, the King of Morocco launched an Equity and Reconciliation Commission to investigate state violence during the Years of Lead. For three years, the film follows four families in their search for the truth: Activist, young rebel soldier or simple citizen, either they or their relations were imprisoned in different parts of Morocco. Each person tries to "find out", discover a "reason", to be able to mourn. But forty years later, the state secret finally unveils the existence of another, more intimate secret, the family secret. They all feel the need to reconstruct history and recover their parents, taken from them twice over, once by their disappearance and another by the secret. Choosing between deeply set silences, lies and taboos within and outside the families, over forty years. Final Reports of IER（Arabic Version）, published by The Advisory Council on Human Rights, 2009. Final Reports of IER（French Version）, published by The Advisory Council on Human Rights, 2009. Final Reports of IER（English Version）, published by The Advisory Council on Human Rights, 2009. Final Reports of IER（Spanish Version）, published by The Advisory Council on Human Rights, 2009.